A united habitation of several communities including Karbi, Tiwa, Boro, Rabha, Garo, Tea Tribes and some others living happily in a fraternity irrespective of caste and communities make a rich cultural identity, which is covered with several hills, green fields and diverse ecological systems spreading towards just south-east and outskirt of Guwahati city, Dimoria is a place where many locations are identified as popular tourists' locations. It is under Dimoria Development Block of Kamrup (Metro) district in Assam. It is easily reachable from LGBI Airport, Azara (Guwahati) and less than an hour journey to cover traveling Dimoria through NH 37 from Guwahati railway station. Nazirakhat: Nazirakhat is a place surrounded by green forest and hills. It is located at a distance of 18 Km from Guwahati city and just 1.5 Km North from NH 37. It is a nice picnic spot. A beautiful water stream is flowing through the spot. An archaeological park and a temple of Lord Ganesha are enhancing the beauty of this spot. Many picnic parties gather during season and holidays. North East Tribal Museum and Cultural Centre: The Ethnic Museum and Cultural Centre at Nazirakhat near Sonapur under Kamrup (Metro) district, Assam is one of the best attractions in Dimoria. The Government of Assam has created this centre to preserve and enhance the rich, ethnic diversity of different tribes of the North East Region. The “North East Tribal Museum and Cultural Centre” is located in the beautiful landscaped hill side of Sonapur along NH-37 which is about 45km away from LGB Airport, 23km from Guwahati Railway Station, 22km from I.S.B.T. and 17km from Dispur Capital Complex of Guwahati City. Ghagua: This place is situated at distance of about 25 Km from Guwahati city. It is suburban to Sonapur town and 7 Km north of NH 37 and 1.5 Km from Digaru Railway Station. It is a popular picnic spot with scenic beauty. Tegheria: Naturally most beautiful Tegheria is situated at a distance of about 28 Km from Guwahati city and at just 3.5 Km south from NH 37. With a small but wintry waterfall and for the scenic beauty, Tegheria is becoming very popular picnic place of attraction to the tourist. The natural beauty of this picnic spot is incredible and has tremendous future of attraction to tourist and therefore, local Gaon Panchayat in collaboration with Soil Conservation Department is executing some development works of this spot for promoting tourism. 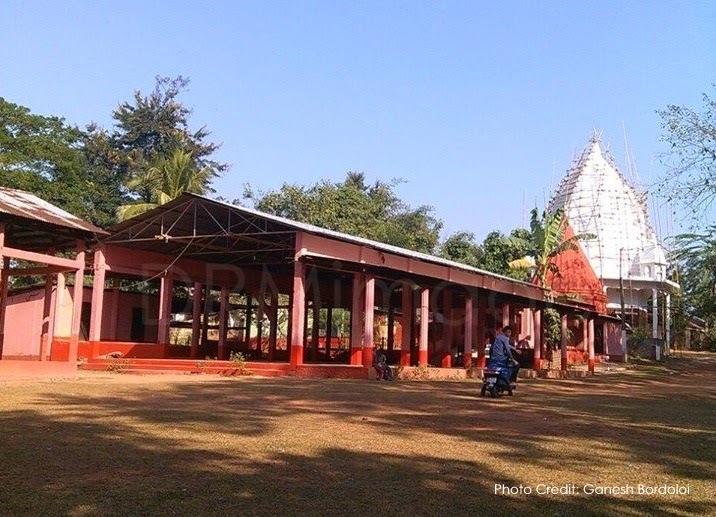 Kamakhya Temple at Khetri: A Shakti shrine - Kamakhya Temple situated at a small hilltop at Khetri is about 30 Km distance from Guwahati city along NH 37 towards east. It is a famous holy place and countless pilgrims throng to Kamakhya Temple and offer prayers for peace and prosperity, where also sacrifice goats, pigeons and buffalo during Durga Puja. Kalamoni Bakori: A few minutes’ walk from NH 37, the Kalamoni Bakori has been as sports and cultural ground primarily of Khetri locality of Dimoria. It is noteworthy that an Open Rongali Bihu function is celebrated on every fourth day of Bohag month. This is ONE OF THE VERY OLDEST OPEN BIHU GROUNDS organized and conducted by Bohubrihi Goshthi. It is also the playground of Dimoria College, Khetri. On Forth Bohag in every year (mid April) many cultural troupes of various communities living in Dimoria perform amidst countless spectators on this Open Rongali Bihu Ground. Among the folk cultural troupes from different parts of Dimoria, the Lalilang dance lead by folk artiste Telpung and Bordhuliya performed by Khaloibari Villagers have been the heart and soul of Open Bihu at Kalamoni Bakori. 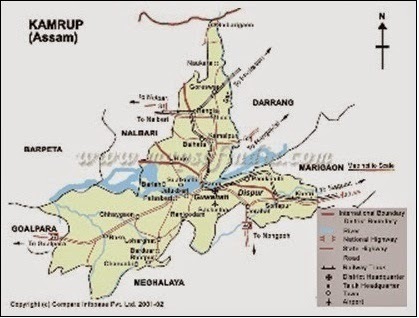 Bamphar / Dhopguri: This area was originally the capital of Karbi King of Dimoria. Now, some ruins are available. The Palace of Dimoria King is situated at Bamphar Village under Khetri Police Station where the present King of Dimoria is living. It is only a few minutes’ walk to the Palace of the King from NH 37 at Bamphar. The King of Dimoria has, at present also, some customary roles in maintaining cordial relationship among people. Tourists may see some great roles of the King during festive seasons, particularly at Parhali Mela and at the time of community fishing at Parhali beel and Jalihora beel during Magh Bihu. The Barter System of commodity exchange is still in practice at Parhali Mela. Tourists may get exciting experience of community fishing and barter system on the day of Uruka during Magh Bihu. Topatoli Organic Citrus Project: At a distance of hardly 2 Km from NH 37 at Topatoli towards south, the Organic Citrus farm has been set up. This is one of the largest Organic Citrus Projects in India adopted by Organic Farmers' Association Assam (OFAA), funding by DRDA and NEC (North East Council). 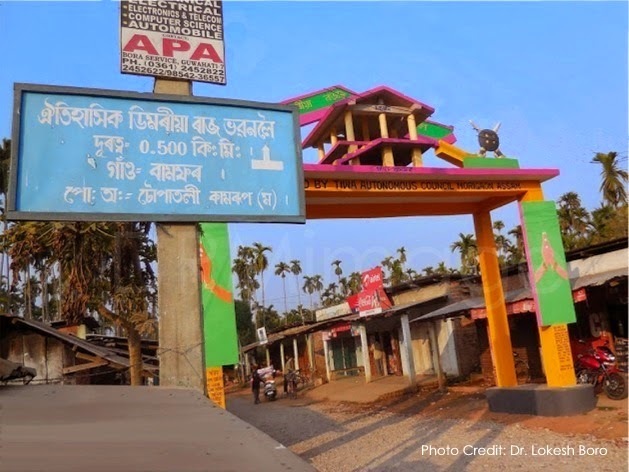 This project is implemented by the OFAA in collaboration with District Administration, Kamrup (Metropolitan). The total area of this project is about 2200 hectare, out of which 1610 hectare is covered by Orange plantation and 590 hectare by Lemon plantation. The entire hilly region of the block area, from the time immemorial, was under Orange cultivation. As we know that "Sonapur Orange" is famous for sweet and sour taste, it is reported that Orange of this area has got tremendous export potentiality, especially in the Middle East and Canada. So, it is a one of the most spelt locations. 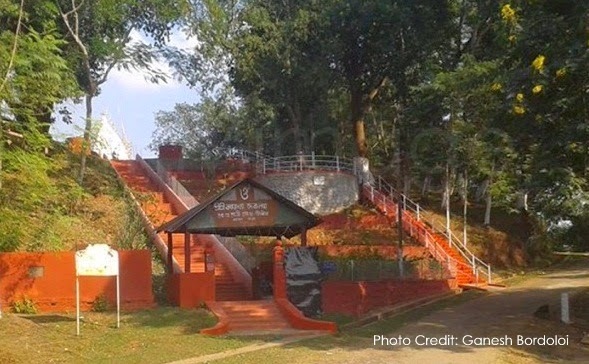 Topatoli Killingghat: Covered with eye catching forest Killingghat is located at a distance of about 45 Km from Guwahati city and 3 Km south of NH 37. Again it is nearer from Jagiroad town of Marigaon district. Killing is beautiful river and the Killingghat is a junction point of boarder of two states, viz, Assam and Meghalaya. The river Killing has bifurcated Assam and Maghalaya. In both the sides of the river the picnic parties gather in large numbers during picnic season. Note: A similar article of the author was also published in merinews.